This camp is located in a muddy hollow, surrounded by tough brambles that act as a defence to outsiders. Stunted trees provide a wall beyond the brambles to protect the cats from cold winds. 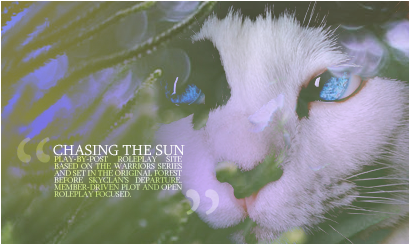 While the pines are not a large proportion of ShadowClan's territory, they nestle themselves closer to the thunderpath and ThunderClan, a section of territory not quite marshy but a little bit more solid for a more standard hunting ground. This is the trademark of ShadowClan, the area where they catch most of their prey. The ground is soggy, with deeper pools of water in places. Long grass covers a good deal of the territory and small patches of pine trees are scattered across the wet landscape. Long ago, this massive tree was struck by lightning. Now only a shell remains. The scorched wood and streaks of ash plainly visible and some claim you can still smell the smoke. It's a common spot for ShadowClan cats to frequent during their search for prey.